Wow, Most French leather club chairs come in various shades of brown, cognac or sand. We see the rare red or black chair... but this rich emerald green salon set is exceptional. Both the couch and chairs sit low and deep. They have all original leather and a blemish here and there which we consider age appropriate wear. 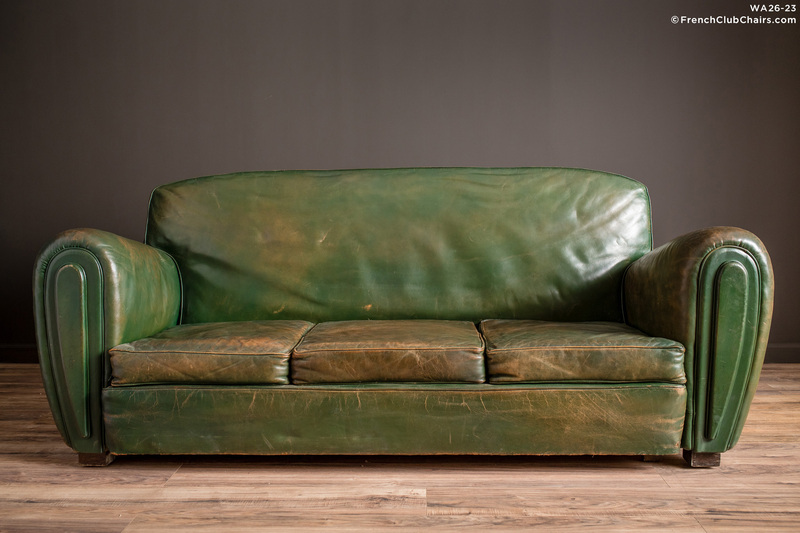 The green patina is faded to beige in some areas, we love it. That a complete set survived 60-70 years in this very good condition is a testimony to the family that we bough it from in the outskirts of Paris. Circa early 1950s. measurements: Chairs: depth-37", width-38", height-33", seat depth-22", seat width-57", seat height-14" Couch: Depth-36", width-80", height-34", seat depth-22", seat width-47", seat height-14"